By all accounts the American Eagle Outfitters Tour of Pennsylvania, presented by Highmark Healthy High 5®, an Espoir-only stage race, is making history - literally and figuratively. Expected to draw hundreds of thousands of spectators and cycling enthusiasts to Pennsylvania in June 2008, the American Eagle Outfitters Tour of Pennsylvania already has three history-making "claims to fame" on its scorecard. Historical significance of the race route tied to tour's designated stage cities. And the new race's significance is not being lost on teams. After a call for race submissions was posted, an enthusiastic response was received by race technical director's Robin Zellner and Andrea Bialick. According to Zellner, "there has been a tremendous amount of interest in the Tour of Pennsylvania, both from domestic and international teams. We knew the domestic teams would respond positively and quickly, but we were pleasantly surprised by the large number of international teams who are expressing interest in participating." When organizers of the "Pittsburgh 250" - a special committee created to promote the 250th anniversary of the founding of the city of Pittsburgh - were looking for a special event that would tie together two cities (Philadelphia & Pittsburgh) that were 450 miles apart, the creation of a cycling stage race seemed to be the perfect answer. Pro Cycling Tour, LLC, a professional cycling event organization and their partner ISM-USA, were called in to work with Pittsburgh 250 to develop and implement the historically significant Tour of Pennsylvania. 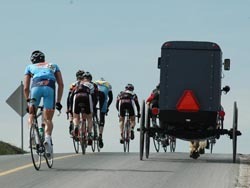 The tour will have racers roughly following the historic Forbes Road (along U.S. 30), which was created in 1758 when British General John Forbes and Colonel George Washington forged a trail through the challenging terrain of the Allegheny Mountains to the Forks of the Ohio during the French and Indian War, founding Bedford, Ligonier and Pittsburgh along the way. From the very beginning race organizers saw the tour as an opportunity to showcase the world's best young cyclists in the espoir class. Invitations will be granted to at least twenty, six-rider teams, including several who are expected to participate in the 2008 Beijing Olympic Games and the Tour de France. According to David Chauner, President of Pro Cycling Tour, LLC, "The future of cycling in America, if not the world, is with the riders who will become tomorrow's champions. We are happy to be able to turn the spotlight on the sport's talented young athletes for a change." The U25 designation made the Tour of Pennsylvania a natural fit for two of its major sponsors. American Eagle Outfitters, the leading lifestyle brand among 15-to-25 year-olds, which is based in Pittsburgh, and Highmark Healthy High 5, a five-year, $100 million initiative of the Highmark Foundation designed to promote healthy lifestyles among children and adolescents. "Sponsoring this tour is a natural fit for American Eagle Outfitters, and reflects the company's commitment to the Pittsburgh region," said Susan McGalla, president and chief merchandising officer of American Eagle Outfitters and member of the Pittsburgh 250 Commission. "We're proud to be involved in a global sports event that our employees and customers can get excited about." The theme of healthy youth will be promoted at the conclusion of each stage through the Highmark Healthy High 5 Finish Line Festivals -- community health and wellness festivals designed to engage local communities in learning ways to adopt active living and healthy eating habits. "Highmark Healthy High 5 is designed to promote healthy lifestyles among children and adolescents," said Yvonne Cook, president of the Highmark Foundation. "The Tour provides an opportunity to engage children and families in the excitement of cycling and showcases the statewide opportunities for people to be outdoors, to be active and to have fun while doing it - all important elements of leading a healthy life." The International Cycling Union (UCI) sanctioned race will begin with a Prologue Time Trial in Philadelphia and will cover approximately 450 miles over six days (June 24-29, 2008), with finish-line events in Philadelphia, Carlisle, Bedford and Ligonier, and a race grand finale in Pittsburgh to help celebrate the southwestern Pennsylvania region's 250th anniversary. A total of $150,000 will be awarded in stage prizes, overall general classification and special competitions - the world's largest-ever prize list for U25 riders. "The route's combination of challenging terrain, and in town circuits make it the ideal format for a stage race," said Jerry Casale, chief operating officer of Pro Cycling Tour, LLC. "Plus we're thrilled that the race will showcase cycling's wave of new, up and coming talent." In addition to inviting Espoir teams from around the world, organizers expect to include several U.S. teams made up entirely of American riders under 25 like USA Cycling's Development Team and the newly-formed Pennsylvania Lightning, an all-Pennsylvania squad being organized by PCT. "The goal is to field a top team that will represent the state's homegrown talent and give Pennsylvanians their own local favorites to follow," said David Chauner.